Yesterday Naughty Dog company announced third The Last of Us DLC, which is going to be the final one. According to the information, the add-on will consist of several packs that differ from each other by price and content. The players will be able to purchase them separately. And the DLC will be available for free for all Season Pass holders. Thus, the first pack of The Last of Us DLC - Grounded Mode - for $4.99 includes the new difficulty level. If the gamers manage to complete the game successfully on this level, they will get the reward. The developers from Naughty Dog have mentioned: “It just could be one of the most difficult Trophies you've ever earn”. The next pack - Reclaimed Territories Map, - the price of which is $9.99, will bring four new maps: Wharf, Capitol, Coal Mine and Water Tower. 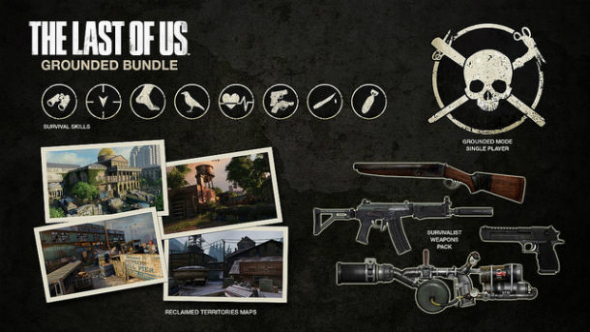 The third pack of The Last of Us DLC, titled Grounded Bundle, costs $5.99 and includes the additional skills for the game’s characters and also some new types of weapon: a double-barrel shotgun, a potato gun, a silenced assault rifle and more. The last pack - Survival Skills - costs $3.99. It consists of such situational and professional survival skills as the faster movement, the automatic equipment, etc. Besides all that, the players will get the fully automatic rifle for free, regardless of the pack they are going to buy. The exact release date of final The Last of Us DLC is unknown for the current moment. And what do you think about such add-on? Tell us in the comments below.